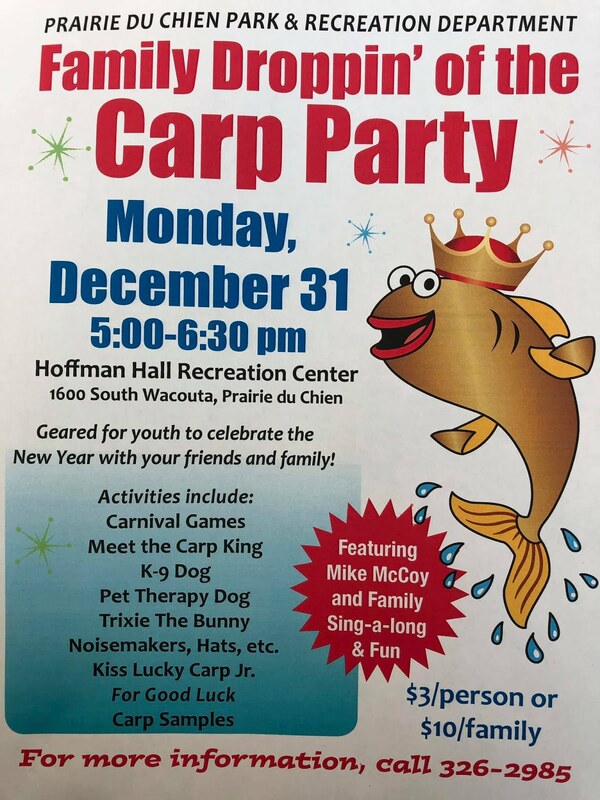 Prairie du Chien has made quite a celebration out of dropping a carp on New Year’s Eve for the past 18 years. Carpfest, as it’s affectionately tagged, is weeks long, leading up to the official turn of the calendar. 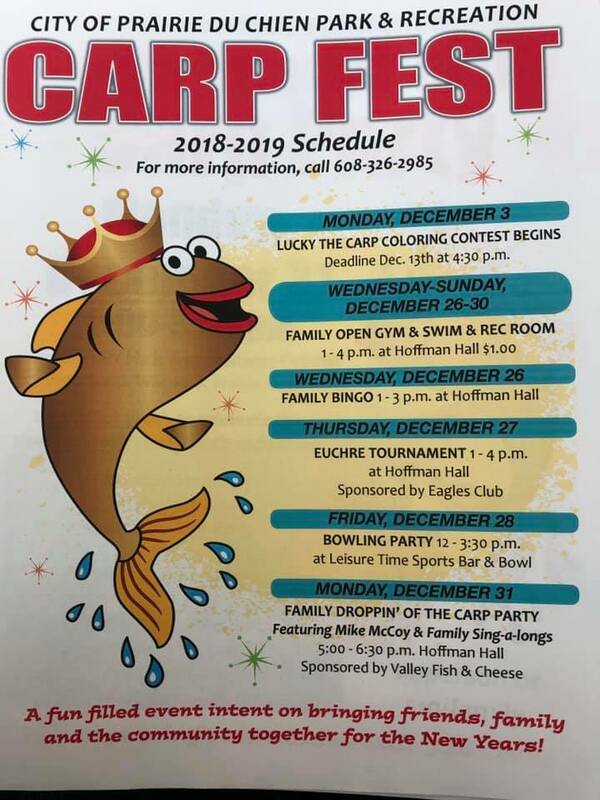 •Monday, Dec. 4—LUCKY THE CARP COLORING CONTEST BEGINS Deadline Dec. 14th at 4:30 p.m.
•Tuesday-Saturday, Dec.26-30—Family open gym, swim, rec room, Hoffman Hall, 1-4 p.m.
Tuesday, December 26th 12 Noon - 3 p.m.
Getting bored over school break? 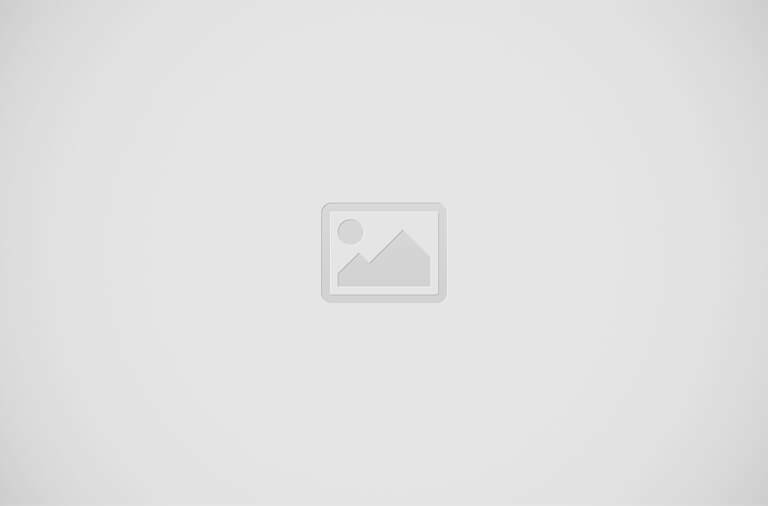 Want to hang out with friends? Want to eat french fries and drink pop? If you can say yes to the above questions, we have just the right Carpfest event for you! Geared for youth to celebrate the New Year with your friends and family! Beginning December 31, at 9 p.m. at Lucky Park downtown will be the area’s largest music, entertainment, and light show, sponsored by Twisted Vision, from 9 p.m. to midnight. There will be a huge bonfire to keep attendees warm. The grand finale event will be the Droppin’ of the Carp and pyrotechnics show when the clock strikes midnight. Carpfest is sponsored by the Prairie du Chien Tourism Council, Fuller Lumber, Liberty Builders, Valley Fish and Cheese, Leisure Time, Huckleberry’s, Prairie du Chien Area Chamber of Commerce, Twisted Vision, Dan Gingerich Crane, Eagles Club and Cliffhangers Snowmobile Club. On New Year’s Day, Jan. 1, a Rotary Club breakfast will cap the celebration, from 9 a.m. to 1 p.m., at Huckleberry’s. 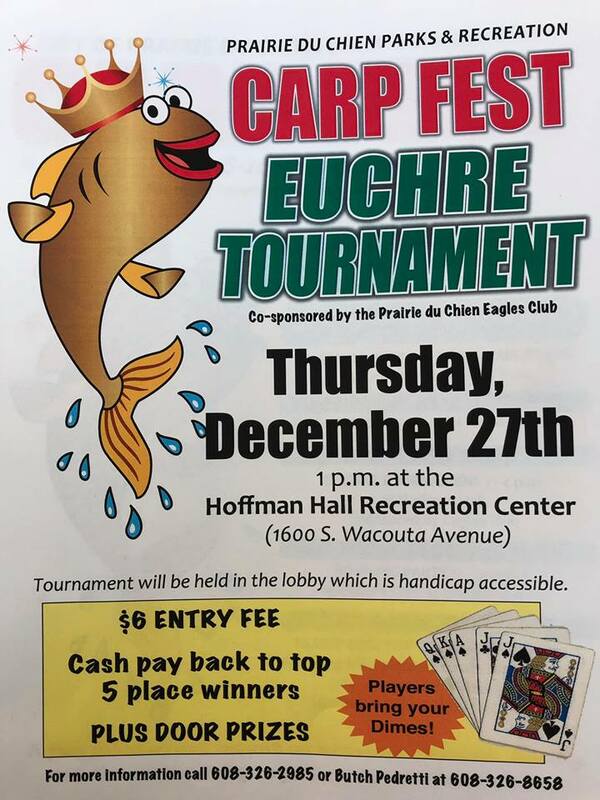 All proceeds from the year-end festivities will benefit the Droppin’ of the Carp and the Prairie du Chien Parks and Recreation Department.